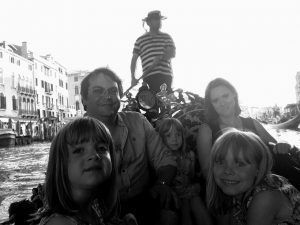 I was lucky enough to go to Venice a couple of times with my mum, dad and brother as a child, and my husband and I went pre-children some years back. I’ve always found it to be a very magical and enchanting place; there really is nowhere else like it in the world. 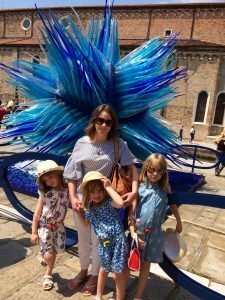 I knew that I wanted to take the girls to Venice one day so they could experience this amazing city. 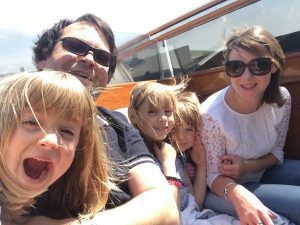 I’d held off booking a trip as I didn’t think the younger two would fully appreciate it and I thought the walking would be too much. 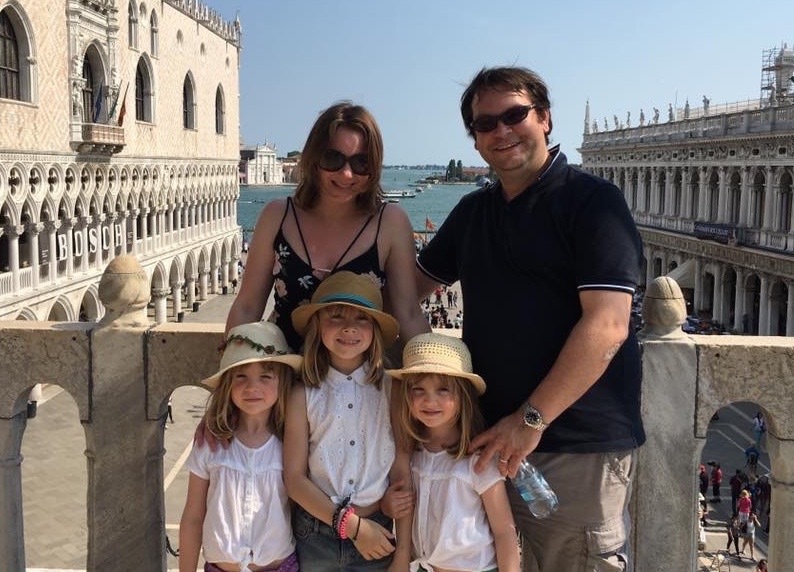 However, when May half term was on the horizon I thought the time was right; Sofia being eight and Maria and Gabriella a few months short of their sixth birthday. 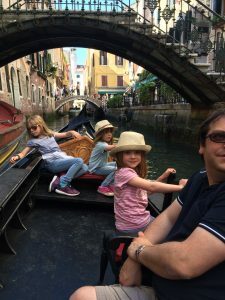 It was a great time of year to go (more about that in the Venice top tips below) and they were definitely old enough as they’ve been raving about it ever since. 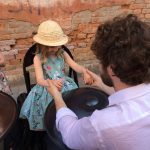 Venice isn’t actually geared up specifically for children in the way that some cities are (here are some that definitely are) with special child-centric activities and cookie cutter childrens’ menus. However, like in most parts of Italy, shops, restaurants, bars etc bend over backwards for their younger patrons. I looked at hotels, but family suites for five were very expensive and to be honest I wanted the children in a separate bedroom (though not a separate room in a hotel) for a bit of peace 🙂 We managed to find an ideal place on Airbnb, which was reasonably priced and literally a minute’s walk from the famous Rialto Fish Market and three minutes from the Rialto Bridge. It was right in the centre but tucked away down a little street so nice and quiet at night. 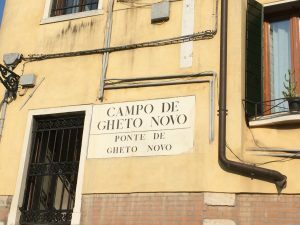 We were staying in the San Polo district. 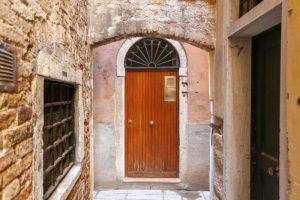 It is one of the smallest districts of Venice and away from the busy Rialto there are plenty of quieter back streets to explore and many very nice squares. 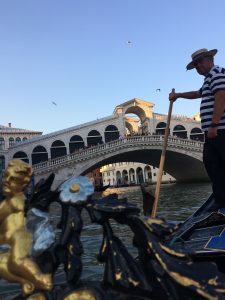 Of course we went to the Rialto Bridge – and visited souvenir shops there so the girls could get a Venetian mask – and visited the fish market. 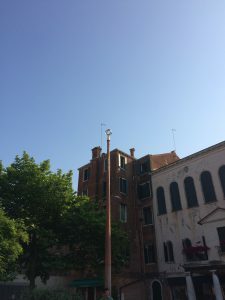 However, we also went to Campo Frari (Frari square) and saw the lovely Gothic church Santa Maria Gloriosa dei Frari and just generally wandered around taking in the sights. 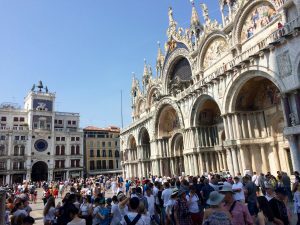 San Marco is probably the most well known district of Venice and famed for Saint Mark’s Square (Piazza San Marco) and the Basilica San Marco (the cathedral). It was pretty busy, but being May, not as busy as it can be. We went into the Basilica and the girls all loved it with its huge expanse of shiny gold and ornate decoration; they especially loved it when we climbed up to the balcony. We were unashamedly touristy and visited Cafe Florian on the square. It is far, far more expensive than going to a bar down a neighbouring street, but hey, we had a drink on St. Mark’s square and we were on holiday. Then we did that other ultimate tourist in Venice thing and took a lovely Gondola ride, which we all loved. OK, we had two Gondola rides by the end of the holiday. We didn’t go up the bell tower in St. Mark’s as the queues were too long. 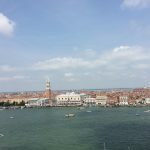 However, we visited the island of San Giorgio Maggiore (a short boat ride from St. Mark’s Square) and went up the bell tower of the church. We didn’t have to queue and the views were stunning though my photos aren’t the best! 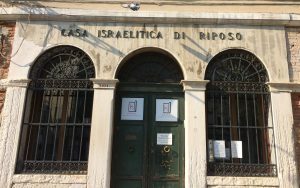 We visited the Cannaregio district to see the Venetian Ghetto (the first ghetto), the area of Venice where all Jews were once forced to live. 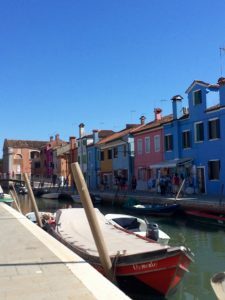 This was a completely different side to Venice, but even away from the ghetto area itself and the tourist area near the train statin, Cannaregio had a very different vibe with many more locals. Here we encountered the wonderful Vino Vero one of my favourite bacari (bars). More details later on! 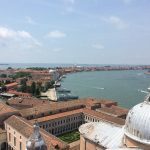 Venetian Arsenal (quay Arsenale) – Nowadays it’s a naval base, but founded in 1104 it was once the largest shipyard in the world. There are armouries and maritime museums to visit, but time got the better of us. It’s a much quieter part of Venice and very nice for a stroll. 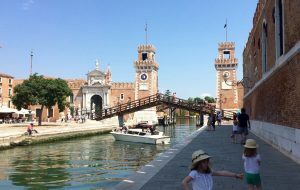 Arsenale is also the epicentre of the Venice Biennale, a very large international art exhibition that is held every two years. We managed to visit one exhibition. However, if we weren’t with the children we’d have visited more. 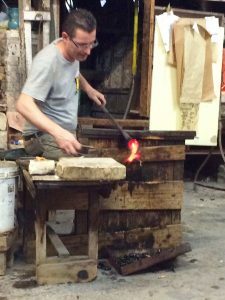 The island of Murano is famous for its glass blowing workshops and is a great excursion to go on. It’s really easy to get to with lots of water buses from various stops; travel time is between 10 and 30 minutes depending on which you take. We had a lovely wander around and a look in at some of the enticing shops. When I asked, one of the shops was happy to recommended a family-run glass blowing factory. It was brilliant, not expensive at all (children were free) and the girls were fascinated. We saw the whole process – explained in English – of making a vase and then the very skilful demonstrator made a child-pleasing horse. 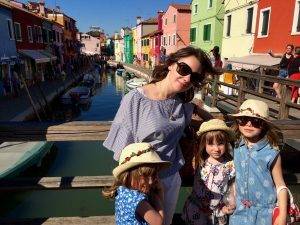 After lunch in Murano, we headed to the island of Burano, which was quite a bit further out, but still very easy to do in a day combined with Murano. 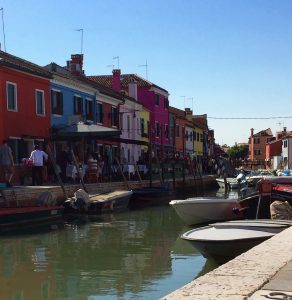 Burano is a very quaint fishing village, famed for its lace production. It is cited as one of the most colourful towns in the world with each house painted in a contrasting vivid hue. 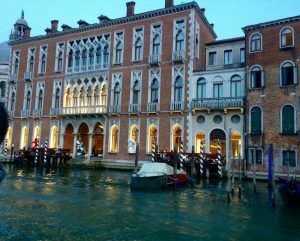 It is very different to the rest of Venice and really pretty. 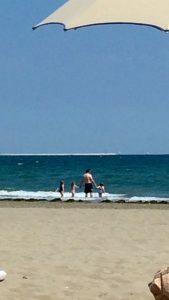 After a lot of sightseeing, we had a beach day. 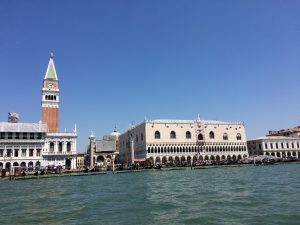 We got a water bus (vaporetto) from the main island to the Venice Lido (where the Venice Film Festival takes place), which took less than 30 minutes. 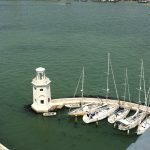 The Lido is a long skinny, sandy island that sits between the lagoon and the Adriatic sea. It had good facilities and umbrella and lounger hire wasn’t extortionate. It was quite strange to encounter roads, cars and buses again! It was a lot more like mainland Italy than Venice. A beach day really broke up our trip nicely. Even if there isn’t a specific childrens’ menu there are lots of eating options. 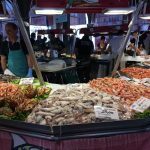 Although Venice is famed for its fish and seafood and has a number of fantastic regional specialities, you’re never too far away from pizza and more familiar pasta dishes. Calamari and spaghetti with clams (other favourites of the kids) are in plentiful supply. Even in more upmarket places, meat and poultry can be simply cooked and they don’t mind if you ask for a pasta with a simple sauce if it doesn’t appear on the menu. 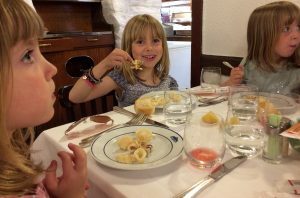 We found Trattoria Alla Madonna in San Polo district great for the family. It’s a traditional place, which is actually a fish restaurant (the oven-baked sea bass is lovely!). 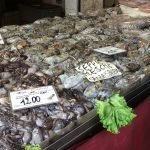 However, there was plenty on the menu for the kids and familiar favourites as well as many authentic Venetian dishes for my husband and I to try; things such as baccala’ mantecato con polenta (puree of dried code with polenta), cuttle fish in black squid ink and raw prawns. We avoided the Michelin-starred places that we’d hit as a couple. However, for a real culinary and wine treat in a venue that is elegant, but approachable Chat Qui Rit is fantastic. The name might be French, but this place is 100% Italian. Really high end food and a wine list that made me practically weep with joy. The menu wasn’t for the kids, but we asked for spaghetti with a plain tomato sauce and they very happily obliged. Then there were the cicchetti: traditional little delicacies of the area which can be described as Venetian tapas; lovely little picky bits that are served with a small glass of wine in a bacaro (small bar). 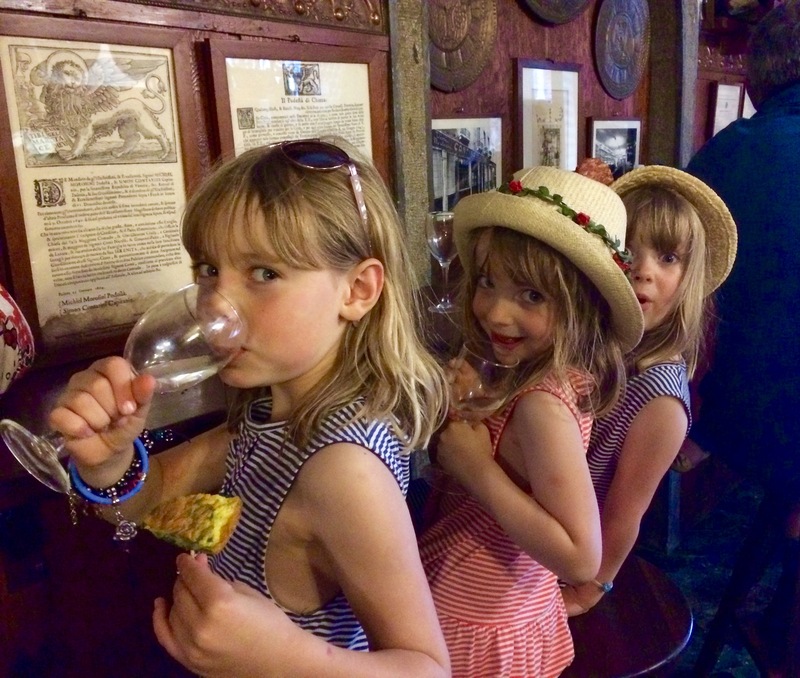 The girls acquired a love of anchovies, octopus carpaccio and soft shell crabs! 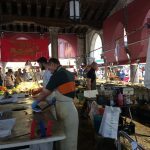 My husband and I filled our boots with Venetian speciality Sarde in saor (sweet and sour sardines). @PartAste provides a great explanation of cicchetti and the culture surrounding them. Our two favourite bacari were completely contrasting. 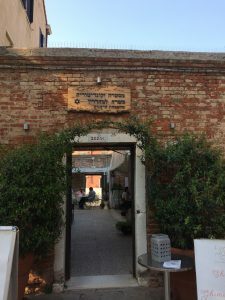 Vino Vero in the Cannaregio district, just by the Jewish Ghetto, is modern and far from the madding crowd. It serves really varied wines and has a very extensive list. 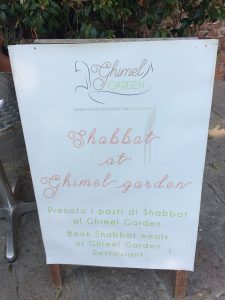 It also serves wonderful cicchtetti and unusually for a bacaro has outside seating next to a very peaceful part of the Cannaregio canal. Cantina do Mori in the San Polo district dates back to 1462 and claims to be the oldest bacaro in Venice. It is very traditional in style, charismatic and has just five seats; bacari are not places for lounging too long – think bar crawl with lovely eats. Both are popular with locals. 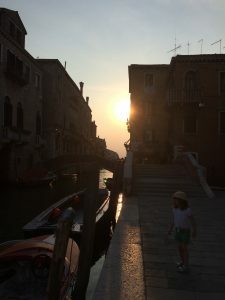 No trip to Venice would be complete without Prosecco and Spritz (Spritz by the way can be made with Campari and Select as well as Aperol, which both hail from the area). Pinot Grigio also comes from the area, but you can get really nice ones, not the insipid ones that we often get in the UK. I also rekindled my love of Soave another Veneto product.